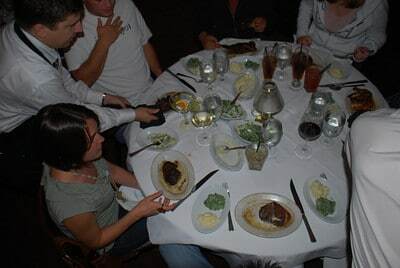 Is there anything better than a steak dinner from Ruth’s Chris Steak House? Freedom Alliance regularly hosts Troop Appreciation Dinners for military personnel around the country to honor them and thank them for their service. On September 9, almost 60 sailors and their families enjoyed a mouth watering feast at the famous restaurant’s Chicago location. The sailors in attendance were cadre at the Great Lakes Naval Station training base, ranging from instructors to recruiters. For some service members Troop Appreciation Dinners are the first “thank you” they have received since being in the military. For injured service members a dinner is often the first public outing they attend and can serve as a form of therapy for them, as many are apprehensive about being in crowds. Troop Appreciation Dinners help service members and their families reconnect, relax, and recuperate. “Thanks for the wonderful night and outstanding food. People like you are the reason I’m proud of serving this fine country,” said Petty Officer Ralph Penass.